The Class A Rated White 15-Amp GFCI (Ground Fault Circuit Interrupter) duplex outlet provides electrical shock protection and prevents the risk of electrical fire.This GFCI has a built in end-of-life feature which automatically alerts the user that the receptacle is no longer effective and needs to be replaced. These receptacles have 2 pole, 3 wire grounded outlets. Wall Plate is Included. GFCI 15A 125V Receptacle is designed for your safety with Self-Testing functionality, LED indicating lights, and tamper resistance. The blade type copper alloy contact piece is designed with good conductivity. Step1: Push the screw lightly into the hole on the left side of the outlet, Preliminary fasten the screw. Step2: Insert the wire through the little hole on the top of the outlet.Step3: Tighten the screw CLOCKWISE. Easy Installation: Complete installation instructions are offered and the whole installation process spends only 10 minutes, Resistance to fingerprint galvanizing mounting bracket,can meet all kinds of install requirements. 2 Indicator LED lights: RED END-LIFE LED indicator light&GREEN Work LED indicator light. When the GFCI provides power, the GREEN light on, when the receptacle out of use, the RED light on. Temper resistant for safety protection: Kids are protected from any alive parts of the receptacle from the outlets to avoid electrical shock. Made of High-impact resistant thermoplastic which is resistant to shock, heat, corruption and moisture, Overload and anti-jamming abilities. Self-Test Function: GFCI automatically tests itself every five minutes, ensuring it works properly. We have proven Safe-Lock Protection feature on this GFCI: if any component is damaged and the protection is lost, power to the receptacle will be disconnected. 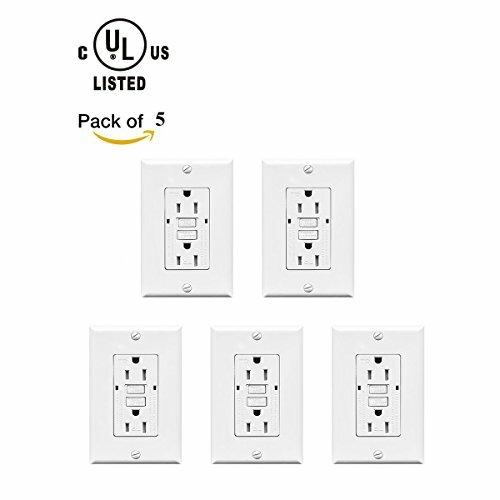 It provides safety protection to the kitchen, bathroom, living room, commercial places or anywhere needs to use electrical devices. If you have any questions about this product by HeroWoo, contact us by completing and submitting the form below. If you are looking for a specif part number, please include it with your message.